A word of warning: This post is a little long, but it has a point. Hang in there. Christmas is weird. It’s a strange time for a parent, and strange time for a kid. What you believe and don’t believe? Now THAT is the question. My parents always taught me that Santa was more about an idea, a spirit of giving. That there WAS a St. Nick, but now we sort of carry on the magic and spread the love around. And all that jazz. I always felt weird about flat-out lying about a big man sneaking into our house in the middle of the night (bringing toys or not)…especially since my husband’s deployed and she’s ALREADY worried about “strangers.” I found it hard to sell that when it didn’t really make a whole lot of sense, did it? I couldn’t really ever get into the “Elf on the Shelf” idea for the same reason. Finally, torn between explaining the real story of Santa and going along with a “lie,” I asked her: “Well, what do YOU believe?” And she thought about it awhile, very seriously contemplating it, and finally said firmly, “I think he’s real.” “Okay,” I said. “Then he’s real.” I’m not sure she entirely convinced herself, but she enjoyed the idea. So somehow, we got on the topic of gnomes. I told her a story about how when I was a kid, my parents took my sister and I on a walk in the woods, and my dad helped us construct a little bridge across a tiny stream with sticks and dental floss. Days later, when we came back to check on it, someone had left a note saying, “Thanks, good job!” We joked that the gnomes had left it. 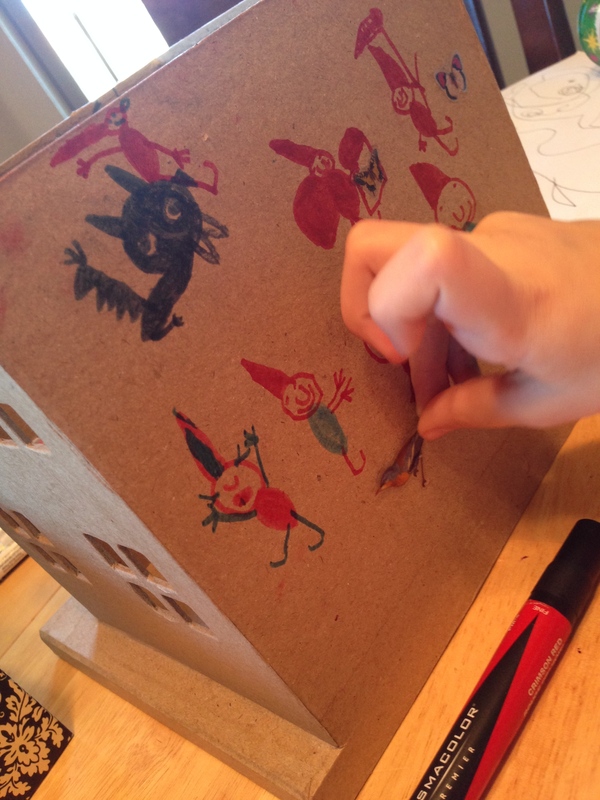 Our daughter loved that story, and suggested we build a gnome house and that maybe if we did, they’d come visit US. I sort of agreed to it, but didn’t think much else about it, dismissing it as one of the hundreds of project ideas she has in any given hour. But days later, and she was still persistent. So we built a gnome house. 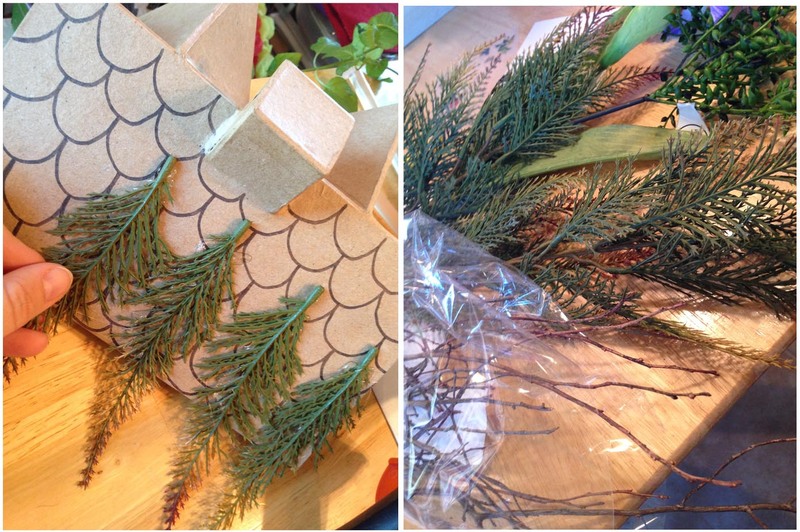 It was a fun little project, and we got all our supplies on a quick visit to the craft store. She was excited picking out stickers and decorative things to go along with it. 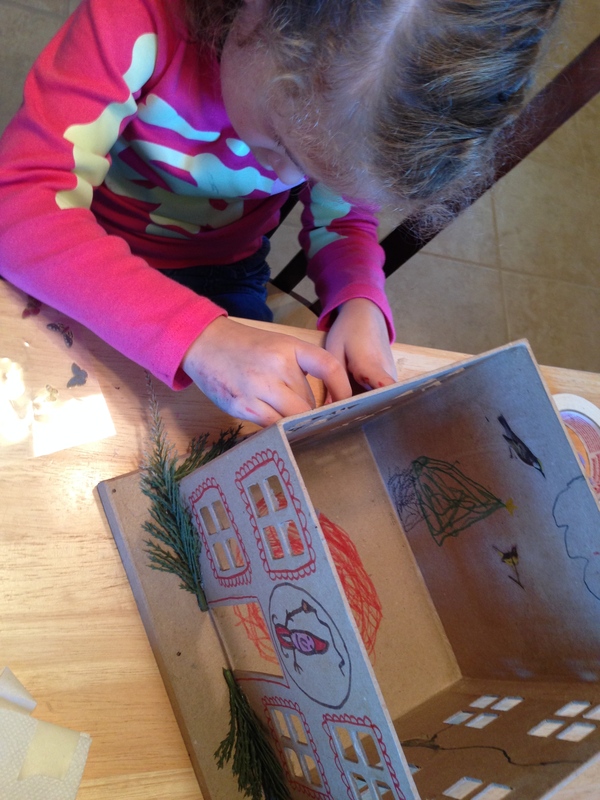 I went the easy route and started with those pre-made papier-mache houses you find at the craft store for $5. 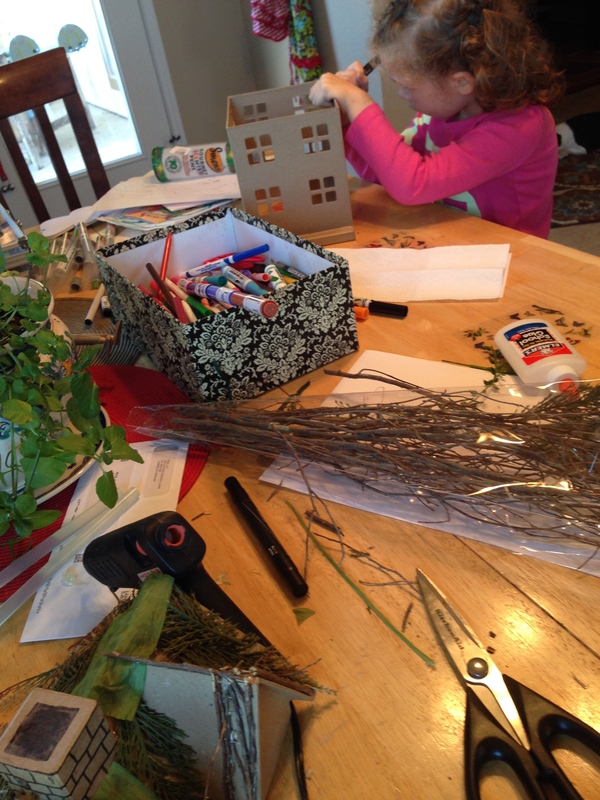 While she happily decorated it with markered gnomes, I hot-glued sticks and fake plants to the roof. 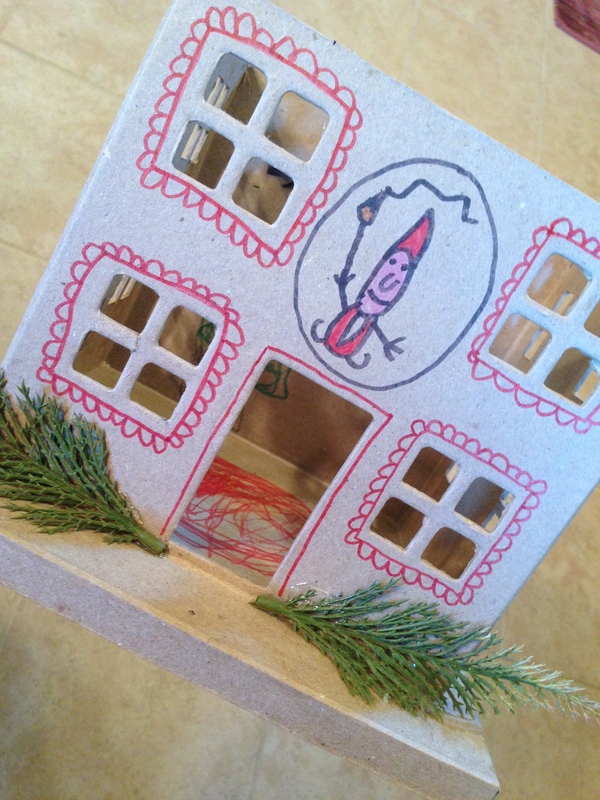 We put some of her dollhouse furniture in it. She put tomatoes in it “for dinner,” she said. And we tucked the little gnome house into the corner of our back porch, to protect it from the rain, since we don’t have any trees around. Later, that evening, I threw out the little tomatoes, partly to see if she’d notice, and partly so our little food-hungry dog wouldn’t tear the gnome house up trying to get to them. It all reminded me a little of the Dinovember post that was going around a while back. Today, it rained. So I decided to have fun with it, and added a few muddy footprints leading up to the house, and a few pea seeds and a tiny carrot from our garden on the table. And I’m not sure if I want to run with it, or just sort of let her in on the fun of pretending…. I don’t want to totally LIE to our kid—she’s always known us to be able to give her straight answers on nearly any topic imaginable. But I don’t want to rob her of that magical fun stuff that makes up being a kid. Her world hasn’t been completely defined by reality yet—for all she knows, there ARE such things as horses with wings or giants. Why not gnomes? After all, we’re all free to believe what we want, right? I would go with the Gnome book, gnomes may be out there living their curious little lives, playing tricks on trolls, befriending forest animals…but they don’t like show themselves. Those books were and still are some of my favorite, knowing full well that the little people don’t exist I still sometimes like to imagine they do. I went to a Waldorf school in second and third grades where I got a large dose of gnomes, Norse myths and Saint Nick. So I have loved the idea of nice folk that can fit into your pocket, little people creating every day items out of acorn caps and pine cones, just like in the Gnome book. If I were you I wouldn’t straight out dispel that world for her, in my experience it was too much fun to sew my own little gnome dolls and make houses for them under rose bushes pretending they were alive. I recommend getting her hands on the series of books about The Littles by John Peterson, I read them in fourth grade. It’s about a family of tiny people and their adventures. There is an animated series based on that but I think books leave more to the imagination and stimulate a creative mind. When she gets older, the Redwall series by Brian Jacques, about sixth grade level. It is about animals who live in an abbey, wear clothes, get accosted by evil critters and go on adventures. I love those little foot steps. And the little bridge! I still believe in Santa Claus, since my Uncle becomes Santa every year & has since 1954, the year I was 8. A couple of years before that, I recognized my Father’s handwriting on a package supposedly from Santa. We celebrated on Christmas Eve & opened our presents then & sometime during the evening, Santa would come with more gifts. When he wore that suit–which my mother made for him in about 1955–he truly was & still is Santa. And if you saw him, you’d believe in him also. Oh, I nearly forgot to mention the Nisse, tiny Norwegian elves who visited in the night while we slept. They always left at least one present. We put out the cookies & milk for them, since Santa had been with us earlier. OMG that is ridiculously cute. The foot prints did me in. How did you make them? I’m guessing thumbprints. Yep, dipped my finger in mud. Wasn’t sure if it’d work but it did great! I especially love this post, because of the way you were able to maintain the ability to believe in magical critters, without interfering with what others believe in. When our sons were little boys, about the age of your daughter, we lived in a very rural area which seemed to be infiltrated with fairies, gnomes, and woodsy sprites. There was a hollow log lying on the ground which we called the elf log. 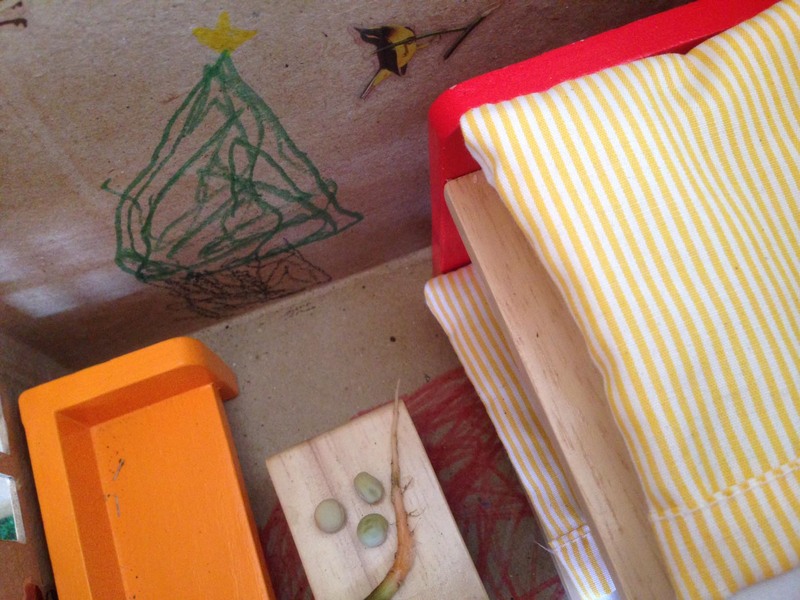 The boys would bring leaves, pebbles and sticks and decorate the interior with “furniture” for the elves. In turn, my husband and I would secretly leave “notes from the elves” for our sons. The whole game was a joy for all of us. On a recent Christmas visit with our sons, who are now grown men, I brought along the box of collected elf notes that I had saved over the years. We all had a good heart warming laugh when we got to “visit the elf log” again through those notes. How very wonderful!! Thank you for sharing that story. I love this! I may borrow this idea around Easter time. Somehow, gnomes and Easter bunnies go together in my head. Ack! The word, precious is all I can manage at this point. And I don’t use the word lightly. The painting above the door is just perfect. Lovely story. My husband and I also try to keep everything honest and frank with our son, but I never saw the harm in believing whatever you want, especially at such a young age. The facade of magic fades soon enough, why ruin it with the reasonings of adulthood? By the way, that gnome you painted looks like he jumped right out of the Gnomes book. I grew up with those books as well. The Fairies book was always my favorite, and still is to this day. Thank you so much–I LOVE the Fairies book, too! My aunt used to have a hardcopy book of the Gnomes, and that was one of my favorite things when I’d visit her. 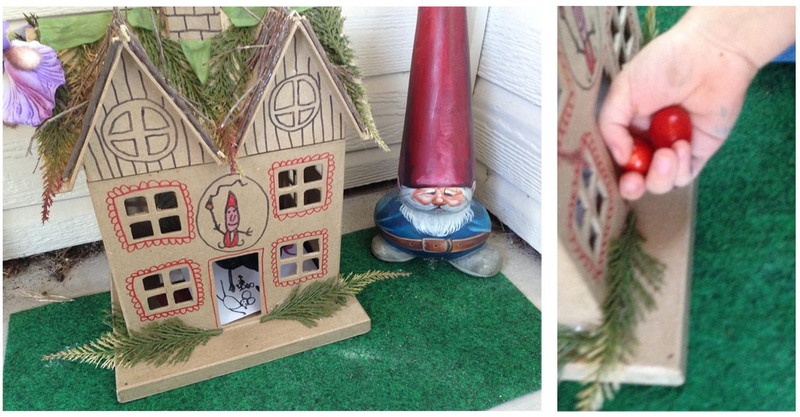 And I agree with you–that little gnome above the door is just the cutest little guy!!! You are a wonderful mother–so in tune, sensitive, attentive and thoughtful in the way you respond to your daughter’s questions and thoughts. Thanks for sharing this story. Thank you! I see it as a privilege to be able to help someone else learn their way in the world…and hopefully save them from a little of the stresses and downfalls that we had. Lovely – both the project and the intent. Your gifts of creative guidance, freedom from judgement, and openness to belief will last your child’s lifetime. I so enjoy your blog. I don’t think what you’re doing is lying to her. If she flat-out asks if you created all the gnome-evidence, just tell her yes — sounds like she’s mature enough to appreciate the idea! Right! I have a small pair of elf shoes that get left around the house once in a while, and now that mine are teens, they just smile! 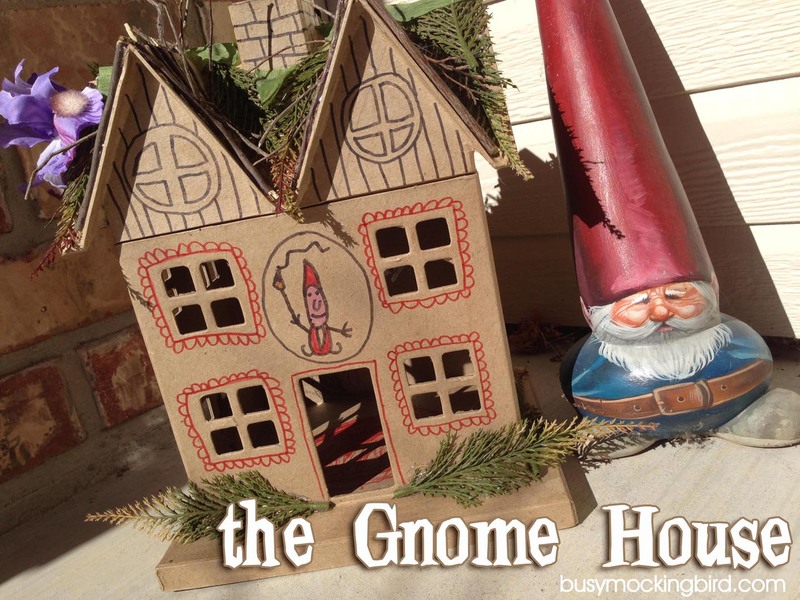 I love your gnome house! Your dilemma here reminds me of the “This American Life” episode (#106) called Father’s Day ’98, Act 4: Age of Enchantment.